The Solution to Picky Eating: 7 types of food with 6 colors, and a smile, too! Have you seen them, too? After doing the research for my article on getting picky eaters to try more veggies, I take notice when I see claims of a new strategy that might be useful to parents of picky eaters. I can’t tell you how many times I’ve started writing blog posts about new studies and then stopped mid-way through when I realized that I was spending more words talking about the limitations of the study than the findings. So I wasn’t planning to blog about this study until I saw it covered on the Wall Street Journal’s family blog. Their article concluded, “To get our picky kids to eat, we may have to become both short-order cooks and food stylists.” No pressure there. CLEARLY not enough color or variety in this meal. The study included 23 children between the ages of 5 and 12-years-old and 46 adults aged 26 and above. The kids were shown different groups of photos of plated food and asked, “Which is the picture that you like the most?” The adults answered the same questions as an online survey. The photos included plates with different numbers of colors and types of food (ie. a plate with just eggs vs. a plate with eggs, bacon, and toast) and different arrangements of foods. Among the arrangements tested were plates with fun designs, as described in the paper: “Bacon was arranged as a smile along the lower perimeter of a plate, peas were arranged in a heart shape and cupcakes and cakes were decorated with images.” How sweet! What did we learn from this food photo exercise? 1. Children preferred plates with 6 colors, while adults preferred only 3 colors. 2. Children preferred up to 7 types of food on their plates, while boring adults liked just 3. 3. Children preferred the entrée to be in the front of the plate, while adults preferred it in the middle. • This was a study about which pictures kids and adults find appealing. No actual food was offered or eaten. According to the paper, not even the idea of eating the foods shown in the photos was mentioned to the participants. They were asked, “Which is the picture that you like the most?” not “Which meal would you most like to eat?” For all we know, the kids chose photos based on which ones they’d like to have on their walls or in picture books. And yet, the Daily Mail says, “Scientists have found youngsters are more likely to clear their plate when there is more colour and choice.” Do you see the problem? • The media has portrayed this study as being about picky children, but the researchers didn’t select for pickiness when they recruited kids to participate. The kids were simply a group of summer campers whose parents gave permission for them to participate. The children in this study were 5 to 12 years old, but the authors mention in their paper that the peak of picky eating occurs between ages 2 and 6, which sounds about right to me. If we are trying to understand picky eaters, we should study picky eaters. This study was not about picky eaters. To their credit, the authors didn’t make any claims that plates with more color and variety would be more likely to be cleared by picky eaters – that is a claim made by the media. The “reporting” on this study is a perfect example of the problem with the media’s coverage of science. The media chooses studies that they think will be easy to understand and that parents will perceive as being applicable and useful in their lives. And then, in this case, they over-interpret the study to beef up its everyday applicability. It’s pretty annoying. You might think that it isn’t such a bit deal, but I would argue that it is. First of all, parents read the articles about this study and start to think that it isn’t enough to offer a protein, a grain, a vegetable, and a glass of milk for lunch. Crap, that’s only 3 colors and 4 types of food! Time to make things more complicated – or at least feel guilty about it. Actually, what is more likely is that parents will see these headline and disregard the whole thing, because they know that next week a study will come out telling them to try offering foods one at a time. It won’t matter if the one-at-a-time study was conducted in young toddlers with real food. By that time, parents have already decided that science is just not that helpful to them. This kind of crap is why scientists have a reputation of being out of touch and unable to make up their minds. I don’t think this study is helpful to parents, and the media write-ups have been plain stupid. You want to know who might benefit from this study? I’d be willing to bet that food marketing types are paying attention. Want to design a Lunchables meal that kids will beg for? Arrange more appealing photos for a McDonald’s Happy Meal menu? Looking for reasons to add more food dye to kids breakfast cereal? For all my complaining, I do think it is kind of cool that the kids liked seeing a lot of color on their plates. It is a great idea to try a greater variety of fruits and veggies with our kids. And smiling bacon? I can get behind that, too. 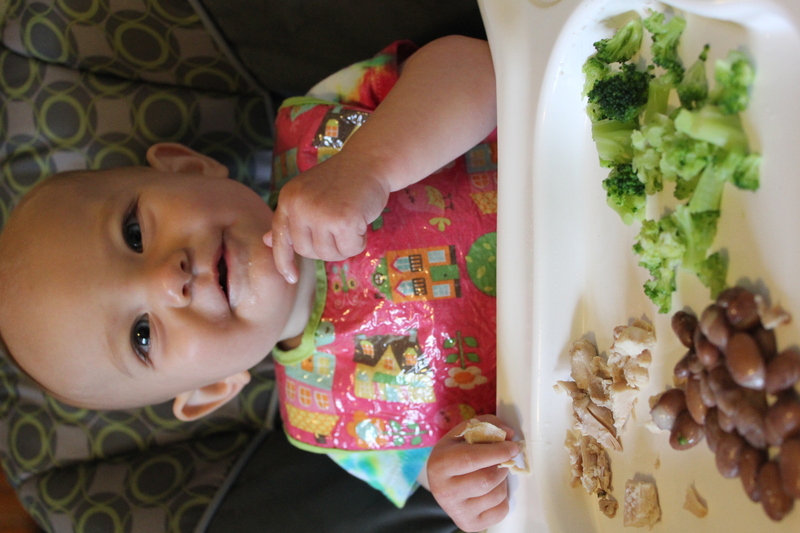 What do your kids prefer – more or less variety on their plates? Typical problem with media portrayal of science. I particularly object to the way that the media treats research as more conclusive than the researchers would have pegged it to be. It highlights the fact that science literacy is important; you have to be willing to dig deeper if you want the truth behind the news stories and popular Internet articles. I agree. I think journalists that cover science stories should be required to have more training in science. We were discussing this on the ScienceofMom FB page a few weeks back and a scientist dad also said he blamed university PR departments (who don’t necessarily have training in science either AND have the agenda of trying to get their school in the press). In this case, I looked at the stories on Cornell’s pages, and I thought they were overzealous about the study but at least didn’t misrepresent it. I am serious when I say that I start posts all the time about new research thinking that the findings are cool and would be interesting to people. Then I get bogged down trying to explain confidence intervals and statistical models and suddenly the story isn’t that interesting. Of course it is interesting to someone, but I understand the challenge of science writers to find fun studies to write about. Seems like a win to me if your picky eater chooses to eat healthy foods! And you know, some of these studies aren’t BS – there is good research done on picky eaters and more worth doing – but why would you pay attention to the science media when they make a big deal about a study like this? Aw man, I was hoping there really was a cure-all for picky eating! You make a really good point about science reporting. It’s so depressing when people say, “Oh, science, it’s not worth anything – they keep changing their minds!” when it’s really the journalists who pimp the latest study like it’s plate tectonics reborn, then flip and run an opposing story the next month. When there’s only one choice and Enoch is hungry, he will eat what’s on his plate. But when there are more choices, he only picks the one he likes to eat. If I put watermelon and something else on his plate, he’s only going to eat watermelon and leave the other one out, and keeps asking for watermelon when he finishes his. So at our house, we actually serve fruits to him later than main dish because Enoch is my fruit boy, he’ll eat any fruit, any time of the day. I do give him different choices of food when I need to feed Michael in our room and I need Enoch to be occupied for a little while. He’ll go through everything on his plate, since I’m not there to ask for more, he will actually try to eat other food other than his favorites. You bring up an interesting point though, Sharon. I wonder how our kids would eat if we weren’t there to watch them and there was no judgement, nobody to care what they ate and how much. I think family meals are important, but this is an interesting thought! My kids (2 and 4) seem to like familiarity – so I try to give them a variety of familiar foods, plus fewer less-familiar foods (in the hope that they will eventually become familiar!). But I think 3-4 well-chosen food choices that work together is better than too many chosen purely for visual appeal! I’m not convinced that either of my children discriminate against foods of certain colours e.g. my 4 year old will wolf down lettuce (so long as it is accompanied by olive oil and balsamic vinegar), but pick out the teeniest bits of clear onion from a bolognaise! And raw tomatoes pass the test, but not cooked ones. I suspect for young kids, visual appeal is almost certainly not the dominant factor, but more smell, taste and texture. That being said, I like it when they eat foods (specifically particular fruits and veggies) of a variety of colours, because often the colours are part of what makes the food healthy (something I’m sure you know way more about than me). Bring on the pink pancakes (with beetroot and blueberries)! I want that beet and blueberry pancake recipe! I agree – 7 foods at every meal just seems like it would be overwhelming and not worth the effort. I just imagine throwing away a lot of uneaten food. oh, definitely texture! my son will put (almost) anything in his mouth, but if it feels funny he won’t even chew it before taking it out. My son is likely to refuse to eat if there’s only one or two foods on his plate, and they aren’t his favourites. But if I add one he likes, then he’s more likely to eat more of everything. (I think of it as just having to get him to START eating, then he’ll keep going). I did try the tip of serving with a tiny muffin tray or similar, with a lot of variety on his plate – then he’d only take the stuff he likes (fruit and yoghurt). Like many parenting hacks, I don’t think there is a one-size-fits-all approach, and I think adopting a particular dogma or approach only gets in our way. For me, the trick is being flexible, trying lots of things, and not being too attached to the results of any single experiment. Because what works for a toddler today doesn’t necessarily work tomorrow. These are wise words from an experienced parent!